A very funny movie. Theodora Lynn (Irene Dunne) lives a sheltered existence in her hometown of Lynnfield, Connecticut. There she lives with her two aunts and plays the organ at her church. Everything is going along well until the local paper buys the rights to run the newest bestseller, The Sinner. The entire town is up in arms over the scandalous book but there is one major problem. It seems that the book's author has used an pseudonym and is really Theodora Lynn. She travels to New York to meet with her publisher to discuss her next book. There she meets Michael Grant (Melvyn Douglas), the man who did the cover art for her book. He is fascinated by her but he realizes that she is not being totally honest with him. He follows her back to Lynnfield to get the true story of her life. She is so afraid that her secret will get out but she falls in love with him anyway. The problem is that Michael has his own secrets and Theodora decides to help him like he helped her with hilarious results. This movie was very funny. 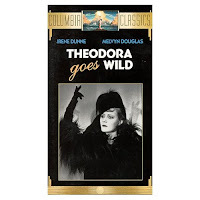 Dunne was wonderful as the uptight Theodora who eventually comes out of her skin. Douglas was also terrific as the man with his own secrets, Michael. A great movie for a lazy Saturday afternoon.